Separation operations are crucial in the chemical and petrochemical industries, not only for production, but also in terms of energy consumption and contribution to investments. And while it’s well documented that most industrial chemical separation processes don’t even come close to the thermodynamic limits of minimum work of separation, they account for up to 70 percent of chemical plant costs. With rising energy prices and increased focus on efficiency and sustainability, the design and implementation of energy-efficient separation processes constitute major areas of opportunity in the chemical industry. In an article published by the journal Nature, two researchers from the Georgia Institute of Technology list seven energy-intensive separation processes placed as top targets for research into low-energy alternatives. 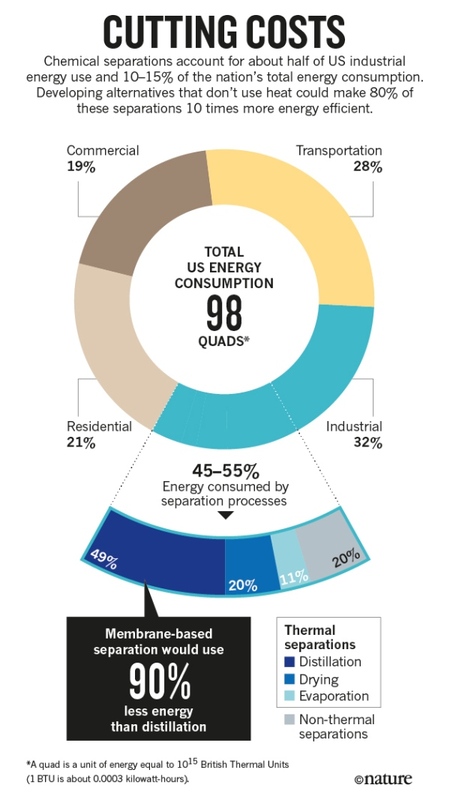 The authors highlight that chemical separations alone account for 45-55 percent of the industrial energy use in the U.S., and for 10-15 percent of the nation’s total energy consumption (commercial, transportation, residential, and industrial uses combined). Distillation and other thermal separation methods (such as drying and evaporation) account for 80 percent of the energy consumed for industrial separations, and therefore constitute the most attractive target for improvement. Alternative technologies that don’t use heat are either under-developed or expensive to scale up — making them feasible for large-scale use is a worthwhile investment in research and development. “These processes are largely invisible to most people, but there are large potential rewards (to both energy and the environment) for developing improved separation processes in these areas,” explains David Sholl, chair of Georgia Tech’s School of Chemical & Biomolecular Engineering and one of the article’s authors. Substituting non-thermal separation approaches could reduce energy costs by $4 billion per year in the U.S. petroleum, chemical, and paper manufacturing sectors alone, and could also reduce carbon dioxide emissions by 100 million tons per year. Hydrocarbons from crude oil. At the core of world’s consumer economy, hydrocarbons from fossil oil are the main ingredients of fuels, plastics and polymers. They are obtained mostly by atmospheric distillation processes, consuming globally 230 gigawatts per year (the equivalent of the total 2014 energy consumption in the U.K.). Uranium from sea water. Despite that the future trajectory of the nuclear industry is uncertain, nuclear power can be crucial to provide electricity without boosting carbon emissions. Although the world’s uranium fuel reserves are limited, more than four billion tons are available in ocean water. Processes to obtain uranium from sea water, leaving behind contaminating metals like vanadium and cobalt, have been demonstrated only at small scales and need to be scaled up for industrial use. Alkenes from alkanes. Manufacturing of plastics such as polyethene and polypropene requires alkenes — hydrocarbons such as ethene and propene — which are produced in excess of 200 million tons per year (about 30 kilograms for each person on the planet), consuming an amount of energy equivalent to 0.3 percent of the global use. Finding scalable systems for alkenes separation that do not require changes from one phase to another could reduce energy use by a factor of ten, and offset carbon emissions by a similar amount. Greenhouse gases from dilute emissions. Anthropogenic emissions of CO2 and other hydrocarbons released from refineries are negative contributors to global climate change. Their removal from sources like power plants and refineries exhausts is technically difficult and expensive. Methods for capturing CO2 and hydrocarbon emissions that are economically feasible still need to be developed. Rare-earth metals from ores. The 15 lanthanide metals, also called rare-earth elements, are used in many essential products (from magnets to catalytic convertors), in renewable-energy technologies, and as catalysts in petroleum refining. Although readily available in natural sources, they are present trace quantities and their separation requires mechanical and chemical processes that are largely inefficient due to the complex composition of mined ores and use large volumes of chemicals, generating significant waste and radioactive by-products. Benzene derivatives from each other. Benzene and derivatives such as toluene, ethylbenzene, and xylenes are essential for the production of many polymers, plastics, fibers, solvents, and fuel additives. They are separated using distillation columns with combined annual global energy usage of about 50 gigawatts (enough to power 40 million homes). Advances in membrane or sorbent technologies could significantly reduce the energy intensity of these processes. Trace contaminants from water. Desalination is critical to meeting the need for fresh water in some parts of the world, but the process is both energy and capital intensive, whether through distillation or membrane filtration processes. While distillation offers minimal margin for improvement, the development of membranes that are more productive and resistant to fouling has the potential of making desalination systems commercially viable for even highly polluted water sources. In their paper, authors Sholl and Lively suggest four steps that could be taken by academic researchers and policymakers to help expand the use of non-thermal separation techniques. Beyond cutting energy use, improved techniques for separating chemicals would open up new ways to obtain critical resources the world needs while curbing pollution and CO2 emissions. E. L. Cussler, B. K. Dutta, Aiche Journal 2012, 58, 3825-3831.